The best strollers for tall people have more than just tall handles. Picking out the best strollers is important because it's one type of baby gear you'll spend a lot of time with. The different kinds are almost mind boggling. We'll start with a little all-around info. "Baby Travel Systems" Travel Systems are car seats plus regular strollers in one package. These baby travel systems are popular for use with newborns and small infants. The "system" includes the car seat - a necessity. The car seat then snaps into a full-size baby stroller. Most of the major manufacturers sell them. They key is to finding the best strollers is to find a travel system that offers a tall stroller. When the baby's very young, this design offers the convenience of just moving the baby with one snap from the car seat base, straight into a stroller. You never have to unbuckle the baby and re-buckle him into a stroller. It saves time. It's basically, "a snap". Imagine three errands in and out of the car, with only one "buckling". It's great. Fortunately, as the baby outgrows the original car seat, the remaining stroller underneath is full-sized, so that you can just continue to use that stroller, for a much longer term. While somewhat more expensive than a very basic car seat and very basic stroller bought separately, we recommend a travel system. It's often the best stroller solution for tall dads or tall moms. You'll enjoy the one-snap convenience from car seat to stroller. When the baby's older, you'll then have a very sturdy stroller remaining. This stroller will be good for another 2 years, depending on your baby's growth. They carry up to 50 pounds. But which are the best strollers for tall people - of these travel systems? The Chicco Cortina Travel System is a recommended combo. This brand won for us, as a specific choice, hands-down. It comes in a variety of fabrics and colors, with small nuances to each, and prices that vary a little bit, depending. Links are below. As mentioned in the story from our home page, most tall parents only concern themselves with tall stroller handles. And like our brother, you'll find tall handles aren't enough. If you only check the handles, you can be stuck with the horrible annoyance of kicking the bottom of the stroller with every long stride. The best strollers for tall parents have room for long strides too. With our Chicco Cortina system strollers, the handles are high enough for anyone from 5'10" to 6'5", and it's virtually impossible to kick the bottom or the rear wheels. The wheel base is simply in the right place for a taller person's stride. It's VERY easy to open...we got adept at snapping the car seat out, and opening the stroller with just one hand while you hold the car seat in the other. We could even get it in the trunk with one hand, the stroller collapses so well. Nothing else came close. And we walked behind a lot of strollers. All the others were "kickable" as you walk, because the stroller bottom - or the chassis for the rear wheels - extends too far to the back of the baby stroller. A parent with an even slightly longer-than-average stride can smack the thing and stub toes constantly. They don't even necessarily have to be tall! A man at 5'10 can find himself kicking the other models as he walks. Remember: the best strollers for tall people have room for long strides, plus higher handles. Graco. All versions we tested were too short, both with limited handle height, and we kicked the bottom. MetroLite, Quatro, Stylus. This was true for all the models. Eddie Bauer line.These definitely had handles on the shorter side. And long strides kicked the back. EvenFlo. While most brands are similar across various product designs, the EvenFlo are a teeny bit different, model to model. With EvenFlo "Connor" model, you'll kick the bottom. With the EvenFLo Eurotek, the handles are better, but they are very narrow for a broad shouldered man or tall woman. It's a possibility, but not recommended for this reason. Baby Trend, Sit & Stand, and Stride Sport The handles were higher, but we kicked the bottom. For a little more money, this taller stroller is ideal. And actually, it may save you money, if you were going to buy a separate regular AND jogger stroller, because this one acts like both. The Baby Jogger City Series Classic. (Or the Baby Jogger City Series Elite/more expensive) models. This stroller collapses in one motion too. Super tall, but comfortable for a mom that may be shorter, easy to manager, can be an indoor stroller too. YIppee! Visit the link and you'll read a lot of reviews from people who are really in love with this stroller for it's all-in-one versatility. We just know that tall people can push it comfortably! Smiles, smiles, smiles. You won't necessarily have to worry about the best strollers of this type, because you might not need one for quite awhile if you have a good travel system stroller to continue using. Our Cortina handles REALLY well, compared to the handling of lightweight umbrella strollers. They are actually more of a pain, because they're typically so flimsy. Travel system stroller handles are higher than the best umbrella strollers, and we pop ours in the trunk faster, thanks to a really good collapse design. Starting with the Chicco Cortina travel system, means knowing you've already got one of the best tall, yet affordable, strollers. But if you have a different car seat already, and need a separate umbrella stroller, consider the following. Once again, as probably-tall parents, you're practically lucky! You really have few that work, so the HUNDREDS out there on the market don't have to confuse you. We measured 5 brands, in 8 common models. With tall parent needs, choices of the best strollers, becomes tricky in umbrella models. Of all those major brands, none of the smaller, lightweight umbrella strollers really works for tall parents. We an say, that the Chicco, however, was slightly taller across different models, and had a little bit of extra room for long strides. Unfortunately, your basic umbrella stroller just isn't made for tall parent use. There are also stroller handle extensions out in the world. We've noticed though, that they don't necessarily collapse or fold. You'll have a weird, big set of bars to poke your baby with, while struggling with the whole kit'n'kaboodle from the car trunk. Others seem flimsy. These are extensions to lengthen a stroller that typically may hold only 30 pounds anyway. Your travel system stroller will probably handle 50. Maclaren models are not tall enough, plus you'll kick the bottom. MaxiCo's "Foray" - handles are too short. Peg Parego - Pliko 3. It has the most handle adjustment and height outside of the Chicco line, but it's still not quite enough for very tall frames. And, it's about $340. EvenFlo - also too short. Rider frames for any brand, tend to have the kick-the-bottom problem overall. These are frames you can set a car seat in, once again. Bugaboo. The designer stroller. Yes, if folds, it off-roads, it bends. It will collapse to practically wallet size. Every celebrity has one. And yes, they're $675-$900. But for us, they just weren't tall enough. The handle is actually low in the most common travel position. The Chameleon model is tallest, but it's still not as tall as other options. That's a rough account of major alternative strollers. But if you're looking for twin or duo strollers, check here. With a 22 pound, and 30 inch size limit to the car seat, an "average length" baby would use it for a year. A tall baby can outgrow it by six months. Ours did. So, when that happens...you'll just get a car seat that's not part of a travel system. That was no problem for us, because at more than a year old, he was too big to carry around in a snap-in seat anyway. He was too heavy. So, it was time for a new system. At that point, you'll probably find a convertible seat has the best longevity from this time period on out. 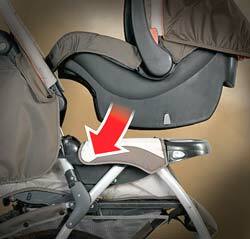 See the this section for more on tall baby convertible car seats. Like us, by the time your bigger baby outweighs the car seat limit, you really won't want to be carrying him or her at 22 pounds PLUS the 12 pounds of the car seat anyway. Se la vi! Because it's fabulous to have the convenience of the travel system, if even for fewer months than average. Visit the section on tall baby/toddler car seats More on best strollers for twins, or double strollers.